I have an irregular heat rate. Common for many people. The device says heart rate of zero and no heart rate detected. When clearly the graph and audio have it recorded... it also does not put the recordings into The history. I would not recommend. Very easy and accurate measurements of pulse!!! Began with A fib and now irregular heart rhythm. The doctor was impressed when I showed him a couple days of history. I think it’s going to be a great tool in my recovery. Consistently records within a range, even had my wife , a nurse validate the numbers. Very cool concept but unfortunately the app doesn't work in my iPhone 6s. I tested it at least 6 times, same error message that it couldn't provide a result very time. It is so easy to use!!! I think Cardiograph is good. I think Cardiograph is a good one. It is useful. I think it is a good one on the Apple App Store. I just wish it had an export to excel or some feature that would allow you to do that. Other than that, it does what it supposed to do. 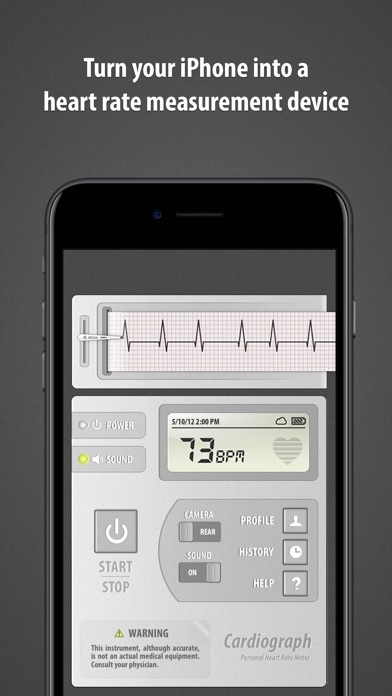 The description says that if you had the paid version of this app, you would get the new Cardiograph app for free. All I can see is a way to pay $1.99 for the new FREE app. Get it straight! Either it's free or it's not...just be truthful. Doesn't work very well with iPhone 7. 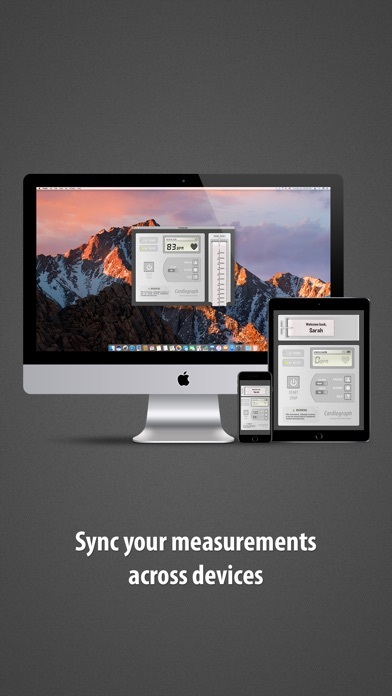 I have been working with 3 different cardiograph apps for many months and this one, the now called "classic" cardiograph wins hands down in many respects. Unlike the new version of this app, the classic is more robust and manages readings in less favorable lighting conditions. Compared with the others, I've never had a situation where a reading was not possible. The others a painfully fussy, unless the light is dazzeling, they won't cooperate or take a brief sample and call it a result. The Classic allows multiple accounts for different family members and allows a library of readings to be collected and recalled. The classic looks more like a functional piece of medical equipment, the new version is a stripped down, minimalistic version without the more detailed animations of The classic. I also find the classic is quite happy taking a reading from one's little finger, or any finger for that matter, the results all being the same. Currently I'm in my 16 month in hospital and can verify the accuracy against the equipment to which I am connected. The doctors and nurses are all most impressed with the app, some of whom have it as well. Overall, I prefer the responsivness, looks and feel of the classic and would highly recommend it to anyone looking for this sort of medical app. As far as the new cardiograph, despite an upgrade, it is infuriatingly fussy about lighting, finger position and movement. I do LOVE the tracing which is far superior to the choppy fake look of the classic. If the best of both designs were combined we'd have a winner I think. Being able to measure and store other family or friends readings is a must however. Final word - a good robust design, nice medical appearance of the controls, good functionality, nice feel but rather fake looking heart beat tracing (the QT interval is terrible) this app wins hands down. Overall, an excellent job. PLEASE PLEASE PLEASE do not remove this version. Minor graphical improvements are needed but the basics are perfect. I say this from 6 months use in a hospital setting. Developers, please contact me if you wish for additional details. Being used alongside professional hospital equipment gives me a unique perspective of the apps in question and how they have worked in a clinical setting. I could feel my heartbeat in the finger, made sure not to press too hard, never saw anything on the graph after multiple attempts. I like that it doesn't require external sensors. Has worked on all my iPhones through multiple generations. The app is not able to detect pulse and errors out in 80% of attempts. Took the phone out of the case, experimented with different coverage and pressure on the lens and it just doesn't work. Thank you for letting those of us that paid for the original app get the new one free!!! I really think this helps those folks with irregular heartbeats keep track. I purchased to log PSVT. The app can't log an irregular heartbeat. It gives an error message because when it doesn't detect a regular rate, it "thinks" it's reading wrong or you aren't placing your finger properly. 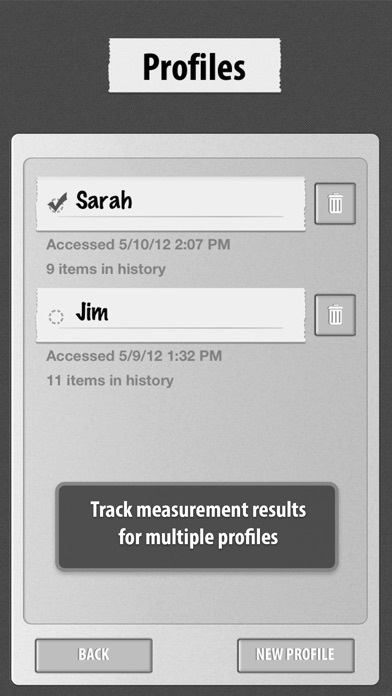 A one button screen shot feature would be a nice addition so the user could at least capture the irregular activity. Needs to do continuous 30 seconds . Me gusta porque puedo monitorear mi ritmo cardiaco todo el tiempo. And, it's easy to use. Takes a little to figure out how to hold your finger consistently. But once you have it it's easy. And compared equal to what the physician found. And as I don't use a health app yet not bothered by it not doing a handshake. I often use this tool to get a general idea of the impact exercise and stress have on my heart rate. It is so simple and portable. Should have read the reviews before I bought the app. I've tried it several times and it never worked. I prefer the Classic version to the new one. It's so easy for me to check my heart rate before, during, and after exercise with this app. I've shared it with many people and they are all impressed. I use it daily when I get up and am always thrilled to see that my heart rate is about 50 at age 74. So tired of developers doing this: offer an app for "free" on "Apps Gone Free", then immediately hit the customers with an "update" that just happens to cost money the very next day. No way am I going to put up with those shady tactics: app deleted. Try treating your customers with respect next time, and maybe people will be willing to pay a fair price for the hard work you've done. Simple, easy to use and accurate. 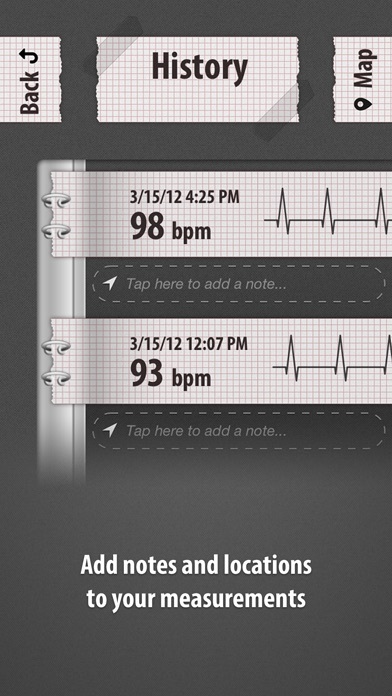 I had another BPM device on the opposite hand and both devices gave readings that were only different by 1 or 2 beats. It takes a couple tries to get the position and pressure correctly, otherwise awesome app! Gives you a quick check of pulse. Wow... great app. I was wanting an app like this. Does a lot and more. HORRIBLE Forgot I tried this last time it appeared on Apps Gone Free. At best it was extremely inconsistent re when it would take a measurement. To be fair, this was on my iPad mini. Now it failed to take a measurement on the first try, stating there was not enough light. mPossible remedies: more light & try not pressing down as much on the camera. The app uses the selfie camera by default. mIt suggested switching to the other camera, which was not possible. Moving the iPad just below a bright light fixture and the app started then quit after one beat cycle. Adjusting the finger used or pressure to super light over the lens was not a solution. The app then immediately offers an improved upgrade, which when you click on, migrates to the App Store with a 1.99 price tag. Recalling the first go around a few years ago, I downloads 2 apps that went free about the same time: this one was faster (about 15 sec) vs 60, though frustratingly inconsistent for when it would take a measurement. The other Cardio, worked every time and one did not have to hold a finger over the lense, rather hold the dp selfie camera in front of your face,mad just until it says hold still, and accurate measurement results (I compare it before and after measurements at different doc offices and the automated machines in drug stores). Note: as it takes the measurement ignore both the displays rate and the EKG like heartbeat strip, as they are both nonsense - but the final result is accurate. Ok heart rate may be accurate but the fakest waveform ever! I want my dollar back! This is crap!!!!! Not an EKG, but a handy way to take your pulse and record irregular pulse. Some MD’s are skeptical if not hostile. Others find it helpful. Used periodically to know if heart is racing. Have compared while in doctor’s office & it is pretty darn accurate. Can sometimes be a little tricky to get the hang of, but it continues to improve. Have recommended many times & will continue to do so. Oddly enough, I get a better reading with the front camera instead of the back considering the camera lens quality and lack of light. When heart rate is around 75 bpm, the app gives me about 79 with the rear camera and about 77 with the front. This is excellent app to track your heart rate. I know I have an irregular heart beat and I check it to make sure it is not beating too fast. About 90% of the attempts I’ll get the error message from the app. Waste of money! Does not work like it claims.